Tyler’s Very First Christmas – in 2008! It took an effort to keep him out of that tree. 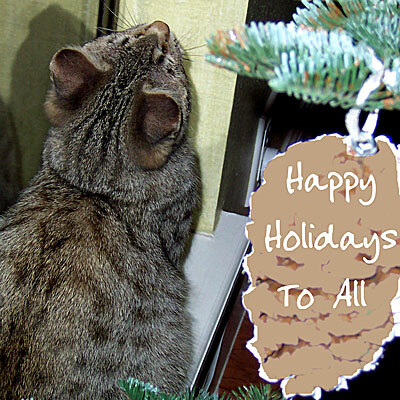 This entry was posted in Pets, Wordless Wednesday and tagged cat, Christmas, Christmas Tree, Wordless Wednesday. Bookmark the permalink. The bottom foot of my tree is always undecorated. It looks funny, but I think it keeps the distractions down. I’ve had more than one tree toppled by a curious pet! Me too…more than one tree toppled until we learned to tie them down to walls. Ahh the things we do for our pets! So glad you posted a Christmas past photo too! I worry every year but none of our cats have ever been interested in climbing the tree but they find a lot of other mischief to have with our decorations! Hehe cute! Thankfully, my Kitty Kitty Meow Meow never tried to climb into the tree. But she did like to lay under it. Well if you’ve ever watched a tree being ridden down like I have – it’s quite the sight. Didn’t know at the time whether to laugh or cry. WOOF WOOF – my momma says it reminds her of our old tabby cat Hobie who liked to go under the tree all the time… love it! WOOF! Hey Piranha, thanks for stopping by. I never had a tabby cat until Tyler. He’s my first, but such a sweetie! He does look like he has maleficent intentions towards that tree. Oh I’m sure he was being quite naughty, but he’s so sweet that I probably forgave him quite quickly! After all, he gives neck hugs!! The tree is hard to stay away from! Yep, I’m afraid it is. Just way too many temptations! Christmas trees are so much easier with dogs. that’s cute, what a pretty tabby. Happy Holidays to you too. Happy holidays to you too. Love that red nose!! Awww cutie, our Lily loves to just sleep under the tree, she THINKS she’s hiding! Oh that’s so sweet. As long as they are just sleeping under the tree, that’s good! Aw, what a sweetie! 🙂 What’s he looking at? A Christmas ornament that’s about to get knocked down? Awww we had two like that last year * sigh * and just seven ornaments on the tree!!! SEVEN 😦 Mum was NOT happy!! Happy Holidays, even if it is from 2008!